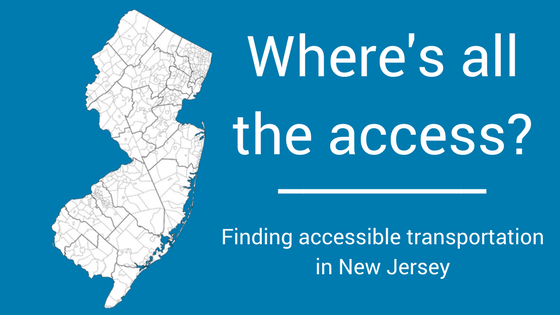 Where’s All the Accessible Transportation in New Jersey? There are plenty of ways to get around (or get out of) New Jersey. We have NJ Transit providing trips throughout New Jersey and into New York. Septa can take you into Pennsylvania and can be picked up inside Trenton train station. Cars and buses whiz through the Parkway and the Turnpike (at least when there’s no traffic) and you can book your next Caribbean vacation at Newark Airport. But can you take advantage of all these travel options if you or a loved one has a disability or special need? Yes, but how do you take advantage of all this accessible transportation? Lucky for you, we’ve taken the time to gather together some resources in this article to make sure you have a head start on your next trip. If you are looking to take your next adventure on the road, you may need a vehicle that meets your accessibility needs. When driving yourself, you have a few options, depending on your particular needs. 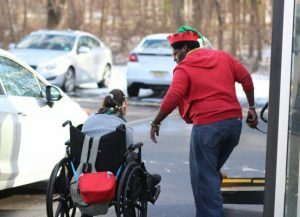 If you can walk short distances without assistance, the only thing you may need is a car with enough storage space to keep any of your adaptive equipment (i.e. walker, wheelchair, crutches). If you are unable to access the vehicle without the use of your adaptive equipment, you may need to either purchase a previously renovated vehicle or have a professional adapt your automobile to your specific needs. We would provide you with a specific company that does this type of work, but we wouldn’t want to endorse one over another, so we encourage you to do your research on who provides these services and be informed about what you need before calling. If you are not driving yourself, you may have a loved one and/or caregiver who assists you. In this case, any of the previously mentioned options may apply and you will need to discuss with your driver what works best for you. There are also options provided by public and private accessible transportation organizations, each one accessed in ways that are unique to the service. For example, Access Link requires you to make a reservation and has guidelines regarding everything from mobility devices to caregivers. Be sure to read through their website before using the service to ensure a smooth ride. You could also take advantage of ride-sharing apps like Uber or Lyft, but this can get quite expensive and the vehicles often won’t meet the transportation needs of people with disabilities and special needs. It’s best to stick to the services specifically designed for people with disabilities than take a chance on a company that may not be able to accommodate your needs. Also, don’t forget about the New Jersey public buses! NJ Transit boasts on its website that they have a 100% accessible fleet of buses, complete with ramps, lifts, and priority seating. You may not have a bus stop nearby to you however, so please check the NJ Transit bus routes and see if they option is useful for you. Getting around New Jersey via train is a great way to avoid parking problems and turn a long car ride into a short jaunt. Plus, through the railways, you have easy access to two of America’s greatest culture hubs – New York City and Philadelphia. According to their website, “Many of NJ Transit’s rail stations are accessible by elevator, ramp, mini high-level platform or portable lift. All accessible stations are shown on the system map with the international symbol of accessibility.” You still need to check their maps and see which platforms are accessible and which are not. Getting to and from the rail stations may require you to use the aforementioned accessible vehicle services, but now that you know about them it should be a piece of cake! If you require any assistance or have any questions, please call NJ Transit at (973) 275-5555 or SEPTA service at (215) 580-7800. When on the platform and the train arrives, be sure to flag down a conductor and ask for assistance as needed. Not everyone loves to fly, but just about EVERYONE loves visiting their favorite vacation destinations. Or you may have a business trip and travel by car just won’t cut it. Either way, you may find yourself at Newark Airport, searching for your gate. 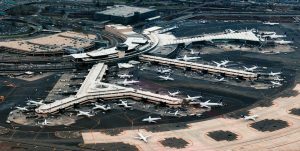 Newark Airport has three terminals, multiple floors and is quite spread out. When it’s busy (which is almost always it can be a confusing place if you do not know where you are going. Thankfully, Newark has made every one of their gates accessible, though it does require some preparation to take full advantage of their services. We should also note that you can get rail service through NJ Transit so you can get to the airport without having to worry about having to worry about parking a car or a van (which saves you some money as well). 48 hours before your flight, you’ll need to give them a call at +1 973 961 4751 and tell them your particular needs. Their staff will help you not only locate and board your flight, they’ll even take you right where you need to be with the use of one of their electric carts. They can take you from the check-in area, to the ticket counter, and then right to your gate. IMPORTANT NOTE: Remember to make arrangements at your arriving airport as well, their processes and accessible options may be vastly different from those in Newark. Lastly, if you find your flight is delayed and must wait for the next departure, the airport has you covered. Their water fountains, restrooms, phones, and service animal relief areas are all fully accessible. So safe travels! We hope you found this article helpful in your search for accessible transportation. Another option is to book your next trip with Easterseals New Jersey’s travel/respite program. We facilitate supervised trips to historical sites both in and out of the United States.